Michael Kosdon, DDS unveils his comprehensive new website featuring information on the full range of cosmetic and general dentistry options available at his practice. Beverly Hills, CA – Dr. Michael Kosdon recently unveiled an advanced new website that elegantly depicts his Beverly Hills cosmetic dentistry practice among the premier providers of high-quality dental services in the nation. 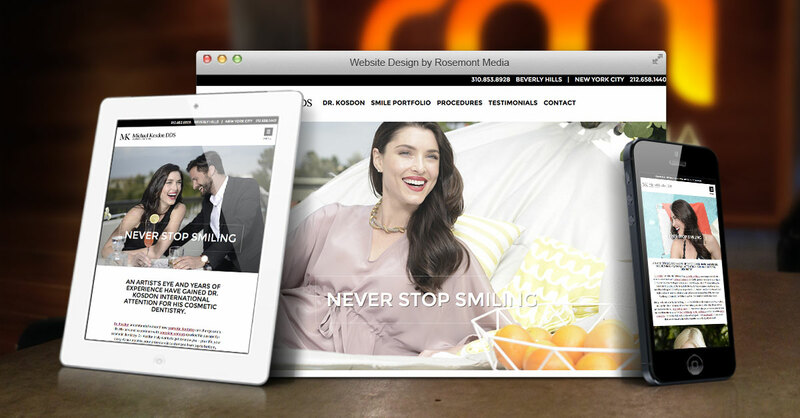 Together with the team at Rosemont Media, a dental marketing firm based in San Diego, Dr. Kosdon aimed to develop a website that delivered the look and feel of his practice, provided accessible, informative content, attracted new patients, and showcased his patients’ stunning smile transformations. During the website development process, the Beverly Hills dentist carefully evaluated all of his options and chose to incorporate many of the most innovative features and functions available to accomplish his goals for the new site. Advanced, user-friendly functionality is evident in several aspects of Dr. Kosdon’s new website, which provides a pleasant, informative experience for all visitors. He explains that the design of the site is fully responsive, making it accessible from all types of mobile devices, including smartphones, tablets, and laptop computers. Responsive design allows the website to adjust to fit the screen of the device it is being viewed on, without sacrificing the intuitive navigation and full website experience. Furthermore, Dr. Kosdon equipped his site with leading dental SEO strategies, which help expand his website’s visibility on search engines, making it easier for new and current patients to connect with his practice for the dental services they desire. In addition to featuring comprehensive information about porcelain veneers, dental implants, and various other procedures and treatments, Dr. Kosdon’s website engages visitors with an interactive image gallery highlighting the many remarkable smile transformations he has achieved for his patients. For Dr. Kosdon, examples of his work and testimonials from his patients are often the most powerful endorsement of his skill and expertise, which is why he focused on developing a unique before-and-after photo experience for display on the homepage and within the site’s smile portfolio. With the help of Rosemont Media, Dr. Kosdon believes that his new website has become a valuable virtual extension of his practice and a powerful way to further expand his patient-base. He also hopes that the site will be a helpful tool for both current and prospective patients alike, providing them with the necessary resources to proceed confidently with the dental care they desire. Dr. Kosdon is a graduate of the USC School of Dentistry. After earning his dental degree, he chose to further his education at the Las Vegas Institute (LVI). An active member of both the American Academy of Cosmetic Dentistry and the American Dental Association, Dr. Kosdon is a prominent leader in the field of cosmetic dentistry. At his practice in Beverly Hills and New York City, he offers a wide array of cosmetic and restorative dentistry services, including Smile Facelift®, teeth whitening, and comprehensive smile makeovers. Dr. Kosdon is available for interview upon request. Merylee is a Staff Writer at Rosemont Media. Having moved from Upstate New York to Southern California as a kid, she considers herself an almost-native of San Diego. Her affection for writing became undeniable as a college student and she was accordingly compelled to embark on a word-addled journey toward her degree from Antioch University Santa Barbara. Her favorite author of all time is Tom Robbins, no relation. In her free time, Merylee is a moderately committed fitness enthusiast with a penchant for people and their stories.